Some weeks ago, I got a "new" eVectra produced by HP around seven, eight years ago. It's specs are nothing special, it has a 1 GHz CPU and 256 MB RAM. The previous owner had, however, changed the original disk drive to something more useful. Now this old computer has a hard drive with about 280 GB disk space! These specs make the computer unusable with modern versions of Windows, but it is very well usable with even the latest Linux distributions. In the recycling room of my dorm, I was able to find an old 17" CRT monitor and a PS/2 keyboard that were exactly what I needed to be able use this computer! Unfortunately I don't yet have Internet connection in the dorm where I live during the weekdays, so I had to bring the computer to my home town for installing a usable system and updating it. I had previously tried to install Slacware on this computer using the set of three CDs, but I could not get xorg configured as I had no idea about the exact specs (especially the graphics card) of this old computer. Without a working Internet connection, it seemed to be too much of trouble to try to configure Slackware's xorg.conf. 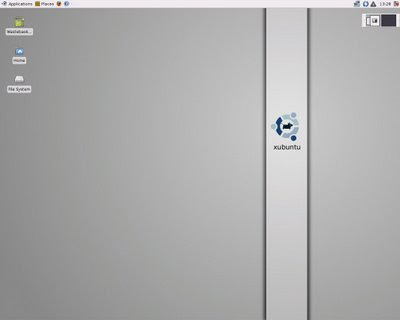 This time, I decided to try the latest stable version of Xubuntu. Installation went without problems, even though it took some time as the hard drive is not especially fast. And Xorg was correctly configured, as one would expect with a distro based on Ubuntu. Next I installed 88 updates (122.6 MB download size). Fortunately my broadband at home is pretty fast, and the download took only a few minutes. After the updates, the CPU is idling between 95% and 97%. After some simplification of the default desktop, CPU is idle 97-98% of time. Most of the CPU usage seems to be caused by Xorg. Pretty good performance by XFCE and an old computer like this. Next I decided to invoke the boot-up-manager bum in order to turn some unnecessary system services off. This way I can further reduce the demands my system sets on the hardware. Bum is a runlevel configuration editor which allows to configure init services when the system boots up or reboots. It displays a list of every service which can be started at boot. With the help of bum, user can enable or disable services after her wish. I decided to turn off bluetooth services, avahi and CUPS. You might want to keep them, but I don't have any bluetooth devices, no other computers in my LAN, and I don't have a printer in my dorm. So I could well get rid of these unnecessary services. I also turned off everything that is useful only with laptops. Now the computer is idling between 97% and 99%. Not bad. 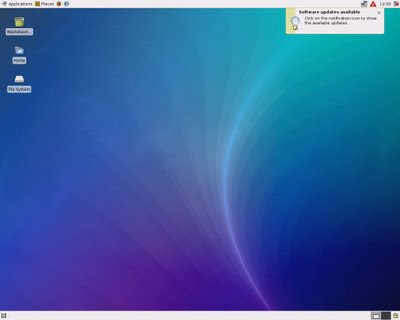 If your computer is older than mine, you might want to check out K. Mandla's great collection of tweaks for Ubuntu Hardy for making your Xubuntu even faster. I'm pretty happy with the performance I got out of the box. It is true, that 8.10 will be released soon, but I'll stay with the released that will be supported for an extended period. I don't need the latest software, as long as the system is useful for my daily computing needs.